A beautiful thank you card to help you say 'thanks' to your favourite people, whether that's family or friends. 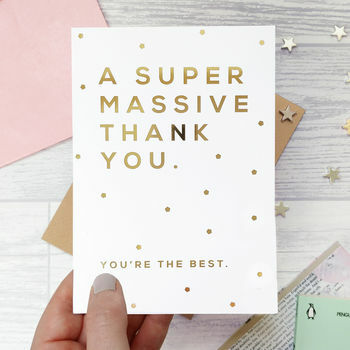 This card features a lovely gold foil design and a sweet little message. Sometimes 'thank you' alone isn't quite enough... a 'super massive thank you' is far more appropriate!